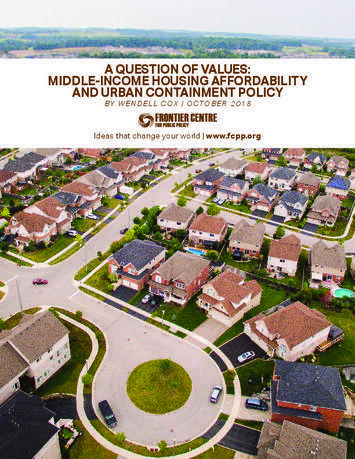 This is the Executive Summary from a new report “A Question of Values: Middle-Income Housing Affordability and Urban Containment Policy" authored by Wendell Cox and published by the Frontier Centre for Public Policy. Ailin He, a PhD doctoral candidate in economics at McGill University served as research assistant. The "report is a public policy narrative on the relationships between urban containment policy, housing affordability and national economies. It is a synthesis of economic and urban planning analysis that is offered as a policy evaluation of urban containment. The analysis is presented in the context of higher-order objectives of domestic policy: improving the standard of living and eradicating poverty" (Page 9). The research focuses on the international experience, especially in Canada, Australia, New Zealand, the United Kingdom and the United States. Download the full report (pdf) here. Middle-income housing affordability is important to people and the economy:Canada’s house prices have risen more than house prices in most other high-income nations. This is of concern, because higher house prices reduce discretionary incomes, which defines the standard of living and poverty. If discretionary incomes are reduced, households will have less to spend on other goods and services, which can retard job creation and economic growth. Improving the standard of living and eradicating poverty are among the highest-order domestic priorities. Urban containment policy can lead to higher house prices: Urban land-use regulation has become stronger in many metropolitan areas and often includes urban containment policy. Urban containment severely restricts or bans development in urban fringe areas. Consistent with basic economics, this increases land values and house prices (all else equal). The planning intention and expectation is that higher housing densities will offset the land-price increases and that housing affordability will be maintained. Severe losses in housing affordability have been experienced in urban containment markets: Top housing and economic experts attribute much of the loss in housing affordability to stronger land-use policy. Housing affordability losses have been sustained in the five nations this report focuses upon: Across the United Kingdom, Australia, New Zealand and some markets in Canada and the United States, house prices have nearly doubled or tripled compared with household incomes as measured by price to income ratios. Much of this has been associated with urban containment policy. Demand and supply: Some research suggests that the huge house-price increases have occurred due to higher demand and the greater attractiveness of metropolitan areas that have urban containment policy. However, the interaction of supply and demand sets house prices. Claims that metropolitan areas with urban containment policy are more attractive are countered by their net internal out-migration and diminished amenities for some households. An intrinsic urban containment amenity seems doubtful: Some urban containment advocates claim that urban containment policy intrinsically improves amenities (such as a dense urban lifestyle). However, whether a feature is an amenity depends on individual preferences. Moreover, the strong net internal migration away from many metropolitan areas with urban containment policy is an indication that there is no urban containment amenity for most households. Higher densities have not prevented huge losses in housing affordability: In contrast with planning expectations, the land-value increases expected from urban containment have not been nullified by higher densities within urban containment boundaries. Intervening urban containment boundaries are more influential than topographic barriers: It has been suggested that topographic barriers such as mountains and the ocean cause higher house prices. However, in urban containment metropolitan areas, urban containment boundaries are usually placed between the built-up urban areas and the topographic barriers. As a result, house-price increase associated with the land shortage will be principally associated with the urban containment boundary, not the topographic barrier. A competitive land supply is required for housing affordability: A risk with urban containment policy is that by limiting the land for sale, large landholders will seek to buy up virtually all of the land for future gain. Without urban containment, there will not be a land shortage, and there will not be an incentive to monopolize the land supply. A sufficient land supply can be judged to exist only if prices relative to incomes are not higher than before the urban containment policy came into effect. Urban containment policy has important social consequences: There are also important social consequences such as wealth transfers from younger to older generations and from the less-affluent to the more-affluent households. Urban containment policy has failed to preserve housing affordability: Some have expressed concern that urban containment policy might not have been implemented if there had been the expectation of losses in housing affordability. In fact, the administration of urban containment policy has been deficient, with corrective actions largely not taken despite the considerable evidence of losses in housing affordability. In urban containment markets, programs should be undertaken to stop the further loss of housing affordability and transition toward restoring housing affordability. Further, urban containment should not be implemented where it has not already been adopted. Canada could be at risk: Canada could be at greater risk in the future. Already, huge losses in housing affordability have been sustained in Vancouver and Toronto. Other metropolitan areas are strengthening land-use regulations. This could lead to severe consequences such as lowering middle-income standards of living and greater poverty with less job creation and less economic growth. The urban containment debate is fundamentally a question of values: Ultimately, the choice is between the planning values of urban design or urban form and the domestic policy values of improving the standard of living and reducing poverty. Urban containment policy appears to be irreconcilable with housing affordability. Proper prioritization requires that the higher-order values of a better standard of living and less poverty take precedence.